Star Trek, the original series, ran in its entirety before I was born. Once my adolescence rolled around, the nascent cable industry bore the fruit of syndication, and old TV shows became new again. Among those shows was Star Trek. I have fond memories of watching the series with my parents, and to this day, the Star Trek franchise is a bonding point between my father and me. Watching the show as a child, I found the character of Spock… well, fascinating. Nimoy portrayed him as the epitome of grace under pressure, with an inner strength and outer calm. To me, the humanity shone through with Spock more than any other Star Trek character—despite him being only half human. Maybe it was partially due to the fact that Leonard Nimoy looked like he could be a lost relative (really, cross Spock and Bones, and you might get me or my father), but I bonded with that character. Despite that “lack of emotion,” I related to Spock. Part of my youth was spent during the CB radio craze. When I’d get to play around on our family’s various CB radios, my handle was “Spock.” I probably would’ve been known as “Spock” on the Internet, had that name not been quickly snapped up everywhere you turned. One of the more embarrassing photos of my childhood lying about is me at Hallowe’en. I’m wearing black pants, a black sweatshirt with grey collar, with a homemade Star Trek insignia sewn onto it. There are plastic pointy ears covering my own, and slanted eyebrows drawn onto my face. I’m looking very seriously at the camera and giving the Vulcan salute (next to a friend in a rubber monster mask). 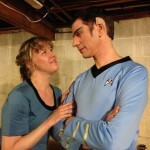 At the time, I even had Spock’s haircut. Actually, that was my hairstyle till my teen years. My wife’s probably still upset that I didn’t want a photo montage at our wedding, partly because I was ashamed of that photo. And I’m a little ashamed now about that reticence. 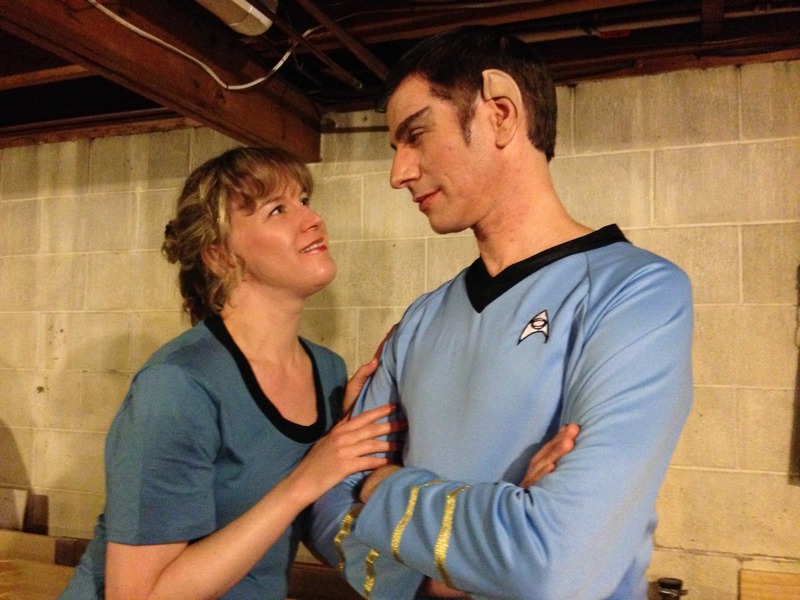 A few years later, when she said she’d dress as a Star Trek character for Hallowe’en if I reprised a Spock costume (all started as a result of a Star Trek communicator app I bought for my phone), I didn’t hesitate. In fact, I did my best to surprass the costume from my childhood in every way I could. Spock was my window into Star Trek as a kid, and Star Trek was my window into the greater world of science fiction. I was—and am—a scifi geek. I owe a great deal of that to Leonard Nimoy. Being a scifi fan wasn’t always easy as a child, but as the geeks have risen with the Internet, I’m proud to have been in on the ground floor. And I have Spock to thank for that. Mr. Nimoy, while I never had the privilege of knowing you personally… you have been, and always shall be, my friend.